The City has basically cut-&-paste their Ballot language from Measure T and will no doubt engage in a similar “fear-based” campaign threatening Service Cuts if this massive Sales Tax Hike doesn’t pass. And CLICK HERE to read arguments against Measure QS: What it boils down to is giving teachers a raise on the backs of homeowners who already pay plenty of state taxes to fund education! Instead of passing a measure that will ultimately raise rents and not pay for any additional infrastructure – take this up with your local representatives and get some changes at the state level. 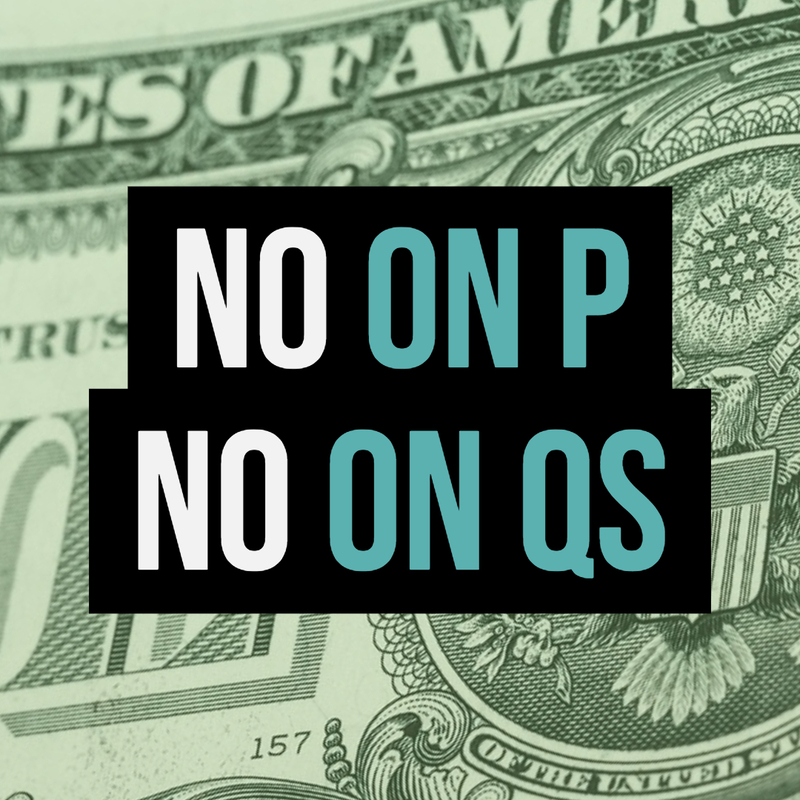 Measure QS is a band-aid approach that will not benefit students in any measurable way. Finally, the BTA’s tactics during contract negotiations earlier this year were completely unprofessional and damaging to students. I won’t reward them by supporting this measure. The Tax places an unfair burden on Burbank Property Owners & Renters who are still paying for previous School Bonds (until 2032), while approx. 1300 Students who live outside the district pay nothing. Businesses with larger footprints are also disproportionally hit. I wish I could have made this event at the old Ikea. I didn’t get home from work until 7:15 that evening. So hopeful they will do something similar again. But here’s an interesting viewpoint from Burbankmom.com. This is the blog that always seems to be in lockstep with the development class in our city. This time she’s a bit “sad.” Which is telling. I’m neutral on this project but very concerned for the congestion it WILL bring. I already avoid the Empire Center and downtown is already pretty bad. You can justify this massive development any way you want but the fact remains: I HEART BURBANK will further transform the downtown area into the congested, zoo-like atmosphere of the Santa Monica 3rd Street promenade when it’s completed. No one can argue against that. But of course Burbank Mom makes it sound like any dissent would be akin to “panic”. Do we want all this for a measly one-time 2.5 million increase to the city’s coffers? Remember the sales taxes go to the region not directly to our city. And the idea that Macy’s “owns” San Fernando Blvd. That one sounds pretty fishy to me. Will have to check that out and report back. The best course is to pay attention to the project and keep getting the word out so the people who live in the area can weigh in. Mega Development Open House this Thurs. If you live, work or do business downtown OR if your kids go to Burbank High you need to attend this open house for the new I Heart Burbank development at the Old Ikea site on San Fernando. It’s this Thursday from 6pm-8pm. More info here. Be advised they are asking to email or text you news etc. Not singling out these I Heart Burbank people specifically, but you should always be cautious online. 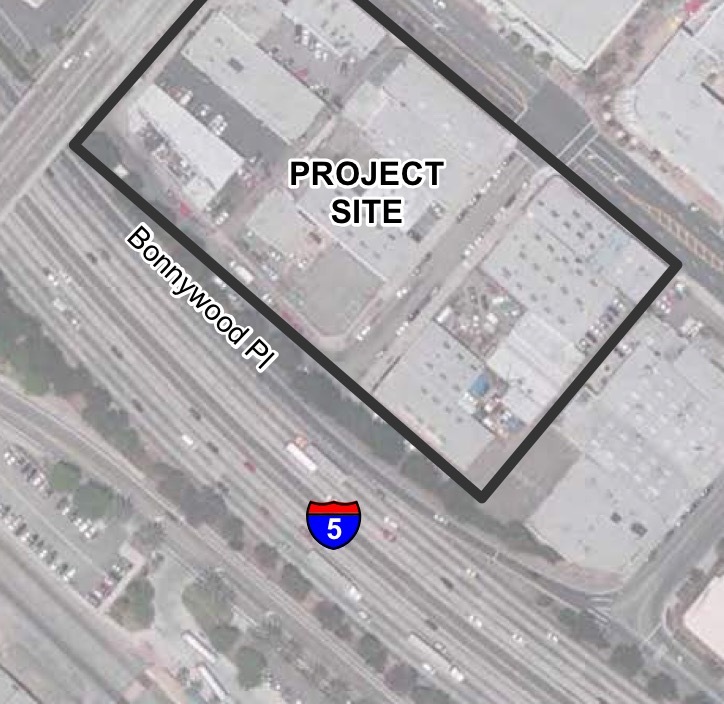 At Tuesday night’s marathon City Council meeting — where the behemoth housing project First Street Village was up for discussion — Councilwoman Sharon Springer asked an excellent question about the cancer risk posed to residents of the 5 Freeway adjacent property. Unfortunately, she didn’t get a straight answer. In fact, a “scientific” study of how highway pollution might affect future residents of the proposed multi-used development on the corner of First and Magnolia (which was paid for by the developer) was presented to the council in a manner which can only be described as disingenuous at best. Well, the consultant explained, if you said 40 percent of Americans will get cancer in their lifetime you’re talking about 400,000 out of a million people. This number is much smaller — only 60.85 people out of a million. 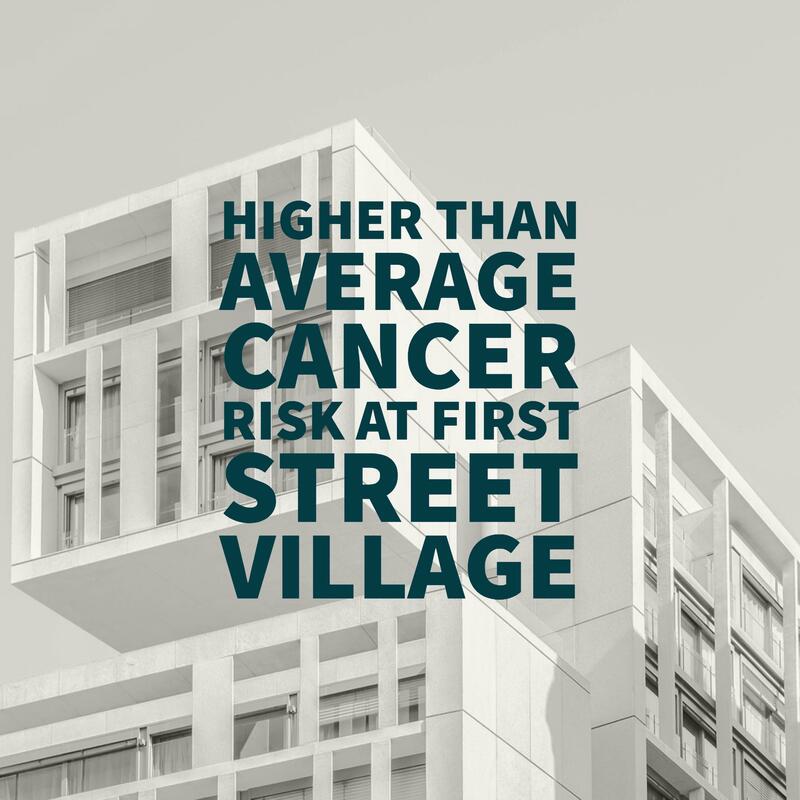 And while this is true — 60.85 out of a million is a smaller percentage than 400, 000 out of a million — it is equally true that 60.85 is almost double the cancer risk faced by Americans who don’t live next to freeways. Their study did not measure Diesel Particulate Matter (DPM); it used Particulate Matter as a surrogate. This ignores the fact that Diesel Particulate Matter (emissions from diesel trucks) is more hazardous to human health than the same mass of other particulate matters. The EPA sets the acceptable cancer risk level at 1 in 1 million. The cancer risk predicted in this study is more than 60 times greater. A Harvard study showed that the relationship to DPM exposure and health is linear. Any increase in exposure to DPM causes an equal increase in health risks. The US average for air pollution-related cancer deaths is 36 per million. In freeway adjacent parts of LA County where air pollution is most intense that number climbs to 70 per million. This study did not look at the impact of exposure to other toxic gases caused by proximity to the highway which, unlike particulate matter, can not be filtered out. In a letter to Burbank’s Planning Department the South Coast Air Quality Management District warned, “Cancer risk still remains a significant impact,” despite assurances from the developer that residents could minimize their risk by keeping their windows shut, staying inside and relying on top-of-the-line filtration systems. That residents will chose to do so — and will instead refrain from using the pool, their balconies and any outdoor building facilities (including the temporary park proposed as an offset to the city granting the development a code variance) — seems, as Ms. Springer pointed out, highly unlikely. When it comes to Diesel Particulate Matter (DPMs), cancer risk is only part of the story. Studies indicate it is a genotoxin and suspect it might alter DNA and cause changes at the cellular level. It has been linked to endocrine disruption, decreased fertility and birth defects. As part of the development agreement, residents of First Street Village will have to sign a waiver acknowledging they’ve been informed of the health implications of their decision to live in the complex and advising them to keep their windows closed and stay indoors as much as possible. This is presumably intended to shield the developer and the city from liability should the predicted health consequences occur. What might be harder to shield themselves against are the ethical implications of targeting young professionals — the much-desired millennials — with promises of housing that seems appealing on its surface (bike paths, public green spaces, modern conveniences) fully cognizant of the fact that it has the potential to make them — and any children they might decide to have — very sick. Knowing what we know about the health risks, is building homes for young professionals on this site the right thing to do? Maybe that’s the question we should be asking. The American shopping mall may be dead — or at the very least on life support — but a handful of real estate investment companies aren’t ready to sing a requiem just yet. Instead, they’re bucking the trend — snatching up shopping malls around the country at bargain basement prices and trying to turn them around. Dallas, TX-based Cypress Equities — which bought a majority stake in Burbank Town Center from the mall’s current owner, Irvine-based Crown Realty and Development, for a reported $250 million last April — is one such company. The purchase of the Town Center mall wasn’t Cypress’s first foray into the Burbank area. The company bought Glendale’s Marketplace in 2013 and, in 2016, it added Pasadena’s Paseo to its roster. It’s been on a cross-country buying spree since 2014, when their private equity arm — Cypress Acquisition Partners Retail Fund — held a private equity offering. One hundred sixty million dollars of the investor money — 40 percent — was specifically earmarked for shopping mall acquisitions. Cypress Equities currently owns 28 retail centers in 14 states. What does Cypress’s ownership of the mall mean for Burbank? In the short term, if you believe the company’s press, it means “a thriving, sustainable community in the heart of Burbank.” Not to mention a much, much fancier mall. At the moment, Cypress Equities Real Estate Management (the retail management and property development wing of Cypress Equities, which was formerly known as Arrow Retail), is waiting for Burbank’s Planning Department to okay plans for a $55-million dollar facelift aimed at transforming the mall from a drab retail mausoleum to an airy, light-filled indoor/outdoor restaurant, shopping and family entertainment space. The company is also partnering with Crown to re-purpose the abandoned IKEA space and the property around it into a mega-complex of apartments, condos, stores, offices, a hotel, a farmers market space and even a skating rink (maybe). An additional 259 rental units at the current Office Depot site. On the City of Burbank Planning Board’s website, plans submitted by the owners give us a few more details. The 259 unit apartment building on the Office Depot site will be seven stories high. A 15 story building will house house 70 condo units where Corner Bakery sits now. That 7-story mixed use building will also include 37,420 sq. ft. of retail/restaurant space and the old IKEA parking lot will make way for a pedestrian walk that will connect the two sides of the street. From the architectural drawings it appears as if that 7-story, 200 room hotel with 10,000 sq. ft. of restaurant space will sit where the Chevy’s and Barnes and Noble are now. The project’s construction has been designed to take place in a series of “phases,” with the Office Depot site “maintain(ing) its current retail use for some time to come” because it has a long-term lease on the site. Like the other developments pending in Burbank, even if this one is approved by the Planning Department, the Burbank City Council would still need to give it the green light. 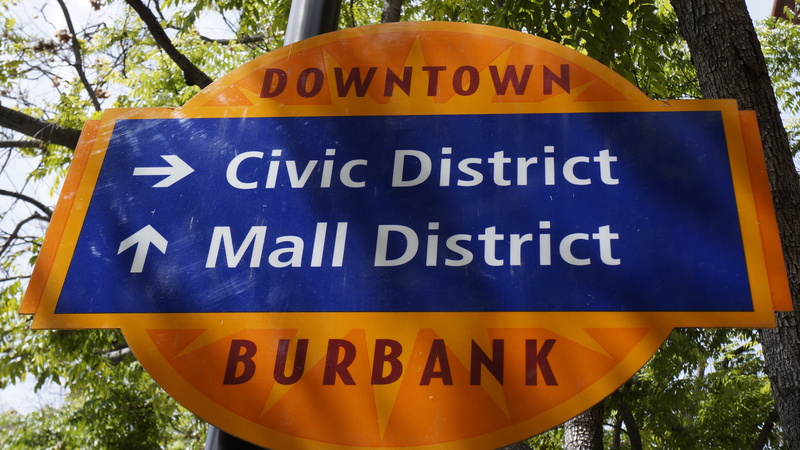 There’s no reason to believe the mall’s out-of-state owners are in Burbank for the long haul. If history — not to mention their own business model — is any judge, Cypress will stick around just long enough for market forces to make the mall and the adjacent mega-development attractive to suitors. Then they’ll sell it off to the highest bidder for a sizable profit and get out. 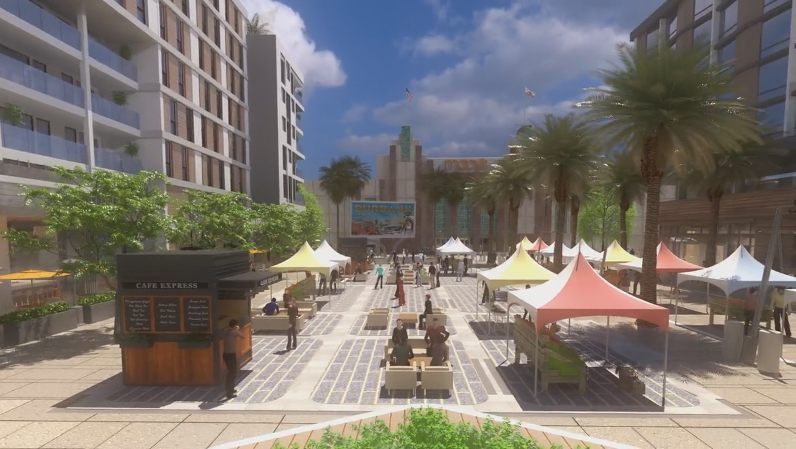 Presumably, then, if all goes according to plan, Cypress will complete the Burbank Town Center project (or whichever elements of it still make financial sense by the time it’s approved) and then they’ll dump it. It’s what they did with The Streets of Woodfield, the mall they bought in suburban Chicago. In 2012, using a $100 million dollar loan, Cypress paid $118 million for The Streets of Woodfield, in Schaumburg, Illinois. The mall is one of the biggest retail centers in Chicago’s Northwest suburbs. Cypress made a few minor improvements to the mall (the property had been completely renovated a decade earlier), repainting the parking garage and asking the city of Schaumburg for permission to add some additional signage. And then, in 2015, they sold it to New York-based Blackstone Group. The flip netted Cypress more than $60 million, a 53 percent profit in return for its investment three years earlier. Not too shabby. In the case of Burbank, provided the commercial real estate market remains strong, there’s no reason to believe the scenario would be any different. Cypress would take its profits and get out — which wouldn’t necessarily be bad for Burbank. Putting the multi-use development component aside for a moment, many residents would look at the mall renovation as a win for our city. But as we examine this project in its entirety, and other development projects currently in the pipeline — but especially those ambitious enough to promise a complete re-invention of our downtown — we must do so while keeping in mind what might happen in a worst-case scenario. Many experts warn that Los Angeles real estate, both residential and commercial, is experiencing another bubble. If investing in our downtown starts to become a losing proposition, can we count on an investment company, beholden to Wall Street, to take the project to completion, even if that means throwing good money after bad? Who knows? And, frankly, Burbank might be willing to take such a risk. But we shouldn’t do so blindly. Thoughtful development means looking at all the options and weighing the good and the bad before making decisions that will change our city for a long time to come. Yesterday, Jim Casey from Preserve Burbank, Gail Nicol from Save Burbank Neighborhoods and I had the opportunity to sit down with the developers for the Burbank mall project (I Heart Burbank). You will recall that, in addition to a total rehab of the mall itself, this project involves building a hotel on the Magnolia side of the mall and a 12-story apartment building on the old IKEA, Corner Market and Office Depot space. We did our best to express our concerns about the the size, affordability, parking, sustainability and traffic implications of the project and explain the context and political climate in which this development is being proposed. If this were the only mega-development in the pipeline and/or if we had trust that our planning department and elected representatives were making intelligent, thoughtful decisions about quality of life issues like traffic, parking, etc. (and, frankly, being honest in their dealings with Burbank residents) we might be having a very different conversation. The size and design of the apartment building. They seemed to understand that many of us would view a high-rise similar to what you’d see in Glendale and West Hollywood as incompatible, so they will revisit that. Impact on schools. After conversations with the superintendent, the developers were under the impression that Burbank High School could handle any influx of students. We shared our impression, as parents, that in fact the Burbank high schools are overcrowded and resources are stretched thin. They pointed out that the school tax on construction — which goes directly to the schools and not into the general fund — might help mitigate this problem. While this was not said, my impression after looking at the plans, is that these apartments are not intended for families anyway so it’s unlikely we’ll see an increase in school-aged children. With an on-site gym, a rooftop pool, and a shared-workplace facility, they seem to want to appeal to young professionals. (In my opinion whether the rare millennial who can afford $2000/month one-bedroom apartment will opt to live in Burbank instead of in Silverlake or off-Sunset remains to be seen, but that is beyond the purview of this discussion). Impact on resources. There are some green initiatives — water-saving devices, power-saving lights, charging stations — already planned, but they have agreed to look for ways to reduce the project’s footprint further. We shared that it is important that they do so especially because residents have been asked to conserve resources, save water, replace their lawns, etc. Affordability. We voiced our concern that Burbank needs affordable housing — not $2000/month one-bedroom apartments — for the seniors, veterans and middle class families who can’t keep up with the rising rents. The developers were already considering setting aside moderate income housing units for teachers and first responders who want to live and work in Burbank. We agreed that was a good start and asked them to think about what they can do for seniors and veterans as well. The Hotel. Their rationale for including this in their plan is that tourist dollars help sustain the mall’s retail shops and restaurants. We advised them that especially because of the underhanded way in which the airport ballot measure vote was handled, residents are wary that efforts to develop Burbank as a tourism destination go hand-in-hand with plans to expand the airport from a sleepy regional airport to another LAX. Also, with so many hotels being proposed for this same area there is a perception that Burbank is being transformed into another Anaheim — with Universal as the draw instead of Disneyland — and nobody wants that. They will consider this. The alternative is another retail store. Parking. They are adding another floor of mall parking and redesigning the layout and exits with a (hopefully) more sensible design. But they are still allocating only 1.7 parking spaces for the new apartment with the idea that people will uber, walk or bike to work. (Apparently Disney told them that they need employee housing close-by so people won’t drive cars to work). This is absurd on many levels, of course, and we suggested that while, perhaps it might be true at some point in the distant future that self-driving cars will eliminate the need for personal cars, they should look for ways to either decrease the number of apartments or increase the number of parking spots for units if they want the support of residents. We have been burned too many times by inadequate parking which causes spill-over onto local streets. Traffic. There is no getting around it — despite what the developers’ own traffic survey says or what the city’s might say eventually, we all know this will negatively impact traffic at a time when traffic is already unsustainable. We suggested they continue to look for ways to make it easier for people to get into and out of the mall and/or the apartments especially in light of the other nearby developments already in the pipeline, and the impending airport construction. (They think the Burbank bridge will be open again by the time they complete construction). We also advised them that residents had lost faith in the city’s ability to determine traffic and environmental impacts and that residents along Glenoaks would not tolerate log-jams like those we are seeing around IKEA. Also of concern is the area around Burbank High School where students are dropped off and picked up twice a day. (At present they use the Office Depot parking lot). Unless they can come up with a viable solution to lessen the impact of both their construction and the project itself on the adjacent streets, they can expect to be met with resistance, especially from residents who live north of Glenoaks. Conclusion. My personal view is that plans for the mall itself look impressive and we all recognize that it is in desperate need of a facelift. I am heartened by the developer’s willingness to listen to resident input and concerns about other facets of their project. If this were occurring in a vacuum and not hand-in-hand with all the other mega-developments in the pipeline I’d say an argument could be made that, with some modifications and concessions, it could be beneficial for Burbank. I actually think it’s unfortunate that this proposal will not come before residents until after other, in my view, less compatible projects have already poisoned the well. 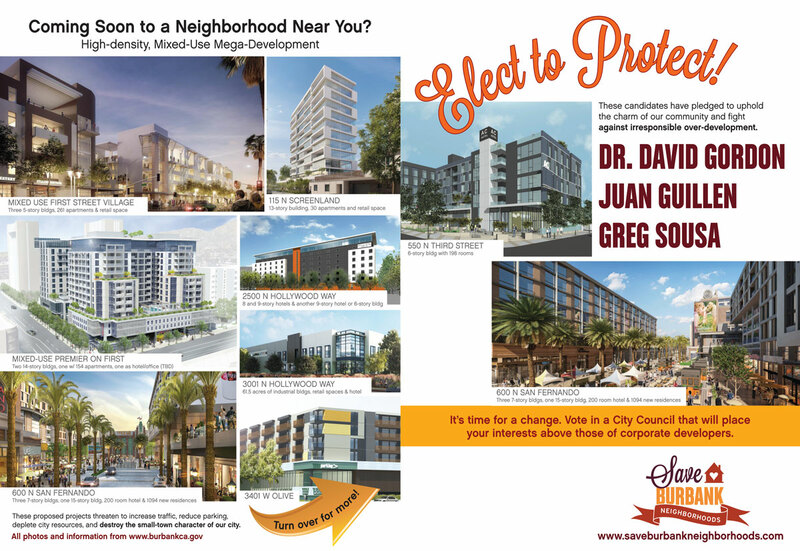 Here’s a flyer every voter in Burbank needs to see and share. The upcoming municipal election is crucial and this shows in vivid detail why. If you are concerned about what is happening to Burbank please share this with your friends and neighbors. Click on the picture to load a high resolution PDF version. Right click on it to save it for sharing. And don’t forget our sharing buttons for FaceBook, Twitter and Google + below this post. Must See TV: Do you live near Burbank Blvd, Magnolia or Olive? At the April 12th city council meeting a young man asked the council what could be done to address rising rents in the city. In his building rents have been raised three times in one year. The fact is that people are being forced out of our community. Would rent control help? What’s your viewpoint? Here’s that the council had to say. Burbank’s Landlord-Tenant commission’s website is here.